Joomla Migration and Planning for 2.5 to 3.x Migration prior to following the steps below. The one-click update will be fine and work well for many. For some larger, more complex sites, the one-click update may not be the best route. For large or very complex sites, you may want to follow instructions for a regular migration and bypass the one-click update functionality. To do this, follow the same instructions for planning 1.5 to 3.x and migrating from Joomla 1.5 to 3.x, simply substitute 2.5 for 1.5 while reading. Create a new database and new user to restore your 2.5 site to. Restoring a site on a local device. See Installing Joomla locally and Setting up your workstation for Joomla development. 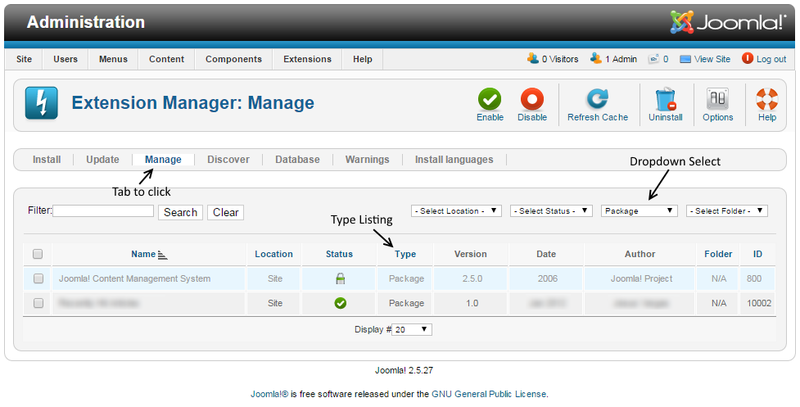 In your test location, update your Joomla 2.5 instance to the latest maintenance release (currently 2.5.28). You are going to be looking at every single extension installed on your site. You will be determining if they need to update to the latest version or be uninstalled. In Joomla 2.5.28 you can go to Extension Manager → Update tab and click Find Updates which will add a tooltip in the Manage tab giving some compatibility information from the backend. This functionality only supports extensions that update via the Extension Manager Update tab. If you have extensions installed that do not use the Joomla extension update then they need to be assessed manually as detailed below. The same goes for those extensions that have a tooltip. You will still need to check the type of package and migration path with the extension developer to verify how to upgrade/migrate. Click the drop-down for Type. Select Package from the drop-down. Selecting Package first is recommended because if there is something you need to uninstall in a package, it will automatically uninstall the associated Modules, Plugins, or anything else in the package at one time. Uninstall any Packages that are no longer needed or will not be migrating to Joomla 3. Repeat this process of going through the Manage tab for all Types in the drop-down: Component, File, Language, Library, Module, Plugin, and Template. If the Author states Joomla! Project, then leave those extensions alone. Smart Search is a Joomla core supported extension even though the Author fields are blank. For all others, make sure that you uninstall those not in use or not compatible with Joomla 3.x. NOTE! You will not be able to uninstall a Template that is set as default. You will need to select a Core supported template like Beez or Atomic and then uninstall the template if you need to do so. Make a note of any versions of Packages and Components currently running that you will be keeping on your site. You can use the Third-Party Extension Inventory Worksheet or just copy/paste them into a document for reference. Update all extensions to the latest versions. The extension has separate packages but upon upgrading to 3.x, they automatically detect this and still work. Make sure the developer confirms this. The extension has separate packages that need to be uninstalled in 2.5 and then installed with the Joomla 3.x version once the site is migrated. An example of this might be a content plugin. It is very simple to uninstall it in 2.5 and then install it again in 3.x. See Template Considerations for more specific information on templates. Note on Core Supported Extensions: If you are using a Core Supported Extension (Banners, Contacts, Messaging, Newsfeeds, Redirect, Search, Smart Search, or Weblinks) in Joomla 2.5 and it has been decoupled in Joomla 3.4+, Joomla will detect their use during the upgrade and install those Core Supported Extensions automatically. 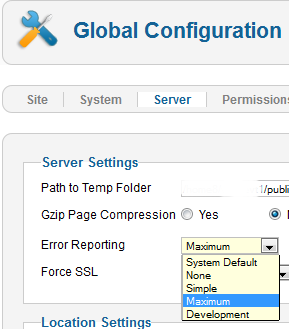 Go to System → Global Configuration → Server tab and turn Error Reporting from System Default to Maximum. Make sure to Save & Close. Go to Extensions → Plugin Manager and enter Remember Me into the Filter and press enter. Disable the Remember Me plugin by clicking the green check mark and making it a red circle. Recommended but not required: Fix assets. (Fixing the assets table). See below for a tool to do this in just a few clicks. Go to Components → Joomla Update. (It should say no updates found. If it doesn’t, update Joomla to the latest version and test. Then do another backup.) Click on the Options button at the top right corner. Select Short Term Support (This is the current text - it may be different in the future) from the drop-down for Update server. 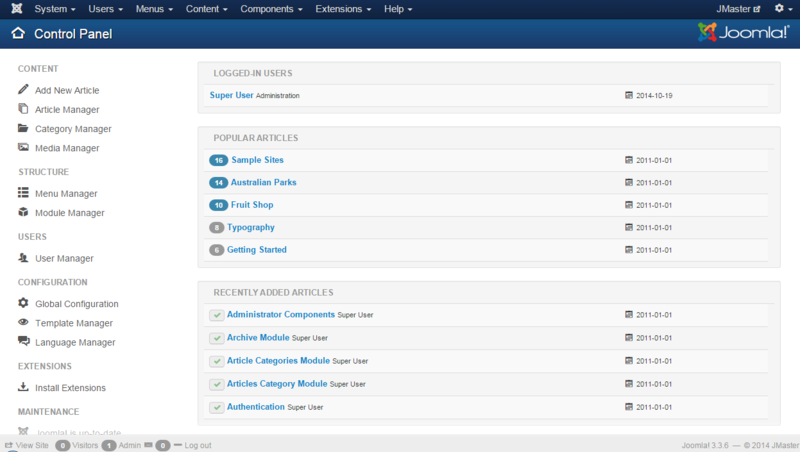 You will then see your Installed Joomla Version, the Latest Joomla! version and the URL for the update package. If the update is not showing up, go to Extension manager → Update and press Purge Cache from the toolbar. Now the update to J3 should show up. Cross your fingers, make sure you turned off remember me and that you have a backup from just before this point. Click the Install the update button. Watch the spinning circle go round and round and feel the anxiety building. No just kidding. The amount of time the wheel spins is dependent on your site, internet connection, and server speed. If all goes well, you will get to a totally new look to the backend administrator panel. Click the Purge button given. Enable Remember Me from the Plugin Manager. Go to the frontend of your site and see if it shows up even if it’s not the right template. If so, continue. If not, see common errors during migration. Go to Content → Article Manager → Options button → Editing Layout tab and set the Save History to Yes. Install your new template or other extensions if you have them to install. Back up often. Configure them. Back up often. Test everything. Back up often. When you’re ready to go live, back up your 2.5 site for the last time. Restore it in a subdirectory or subdomain if you would like to. Back up your Joomla 3.x site and move or restore your Joomla! 3.x site to the root (or change nameservers if you were building on a temp domain at a new hosting account root). Remove 2.5 site from server within a couple of days. Remove all dev sites you may have been working with or keep them up-to-date if they are running a current version in order to ward off hack attempts on your server. If you had data change on the 2.5 site while you were migrating to 3.x you will want to get that data moved over to the 3.x site before going live. You can do this manually (make sure you keep the same user IDs - go in order) or by using a transfer tool/third-party extension. ACL Manager ACL Manager to fix asset issues in a few clicks.